Hello Katie Girl: BBQ Attire Plus a J. Crew Rant! BBQ Attire Plus a J. Crew Rant! Just because an event is casual, doesn't mean you shouldn't try to look nice and polished! 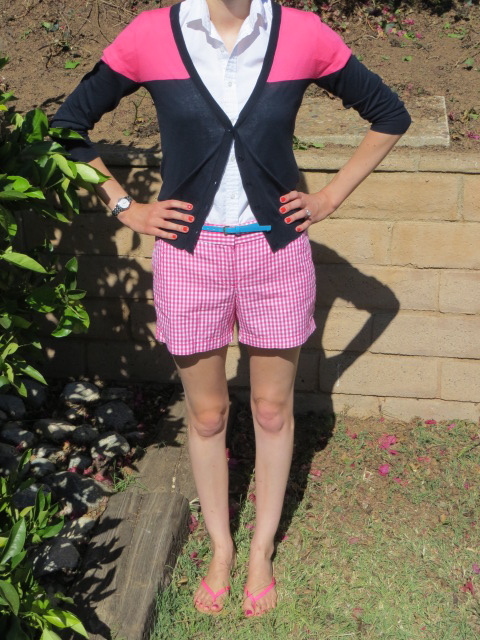 This is what I wore this weekend to a BBQ. The majority of my outfit consists of some awesome bargain finds at J. Crew! The sweater is the featherweight cotton colorblock cardigan from J. Crew. 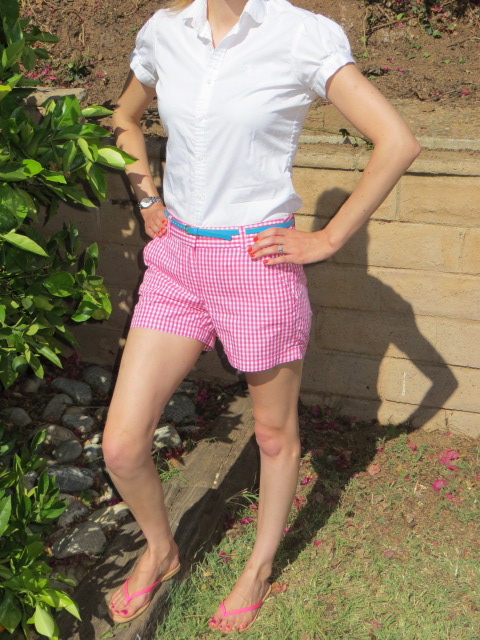 The gingham shorts and belt are also J. Crew. The shirt is from the Ralph Lauren outlet which I bought years ago on the way to Las Vegas. My sandals pictured here are the J. Crew Capri sandals. I purchased these last year and they were made in Italy. At $50 retail (I bought them on sale for about $25) they seemed expensive. Now, the same sandals are made in China and guess what? They still retail for $50! I ordered a pair this year on sale thinking they were still made in Italy. When I saw that they were made in China and the quality had declined I promptly returned them. On the CNBC special J. Crew the Man who Dressed America it revealed that Mickey Drexler reads blogs and uses them as feedback about his products. Well, if Mikey is reading this I would like to say please continue making your shoes in Italy. I will stop buying J. Crew shoes if they are made in China...and I buy a lot of shoes, as my husband will attest! love the outfit! and i totally agree with you on the shoes (and handbag front, too). I am glad you also feel the same way about leather goods as me. If enough people refuse to support companies that decide to lower standards of quality while keeping prices the same (or increasing them) hopefully they will get the message and stop!